I just saw some people coming to my blog from an article published on The Register where the author referenced e(fx)clipse. 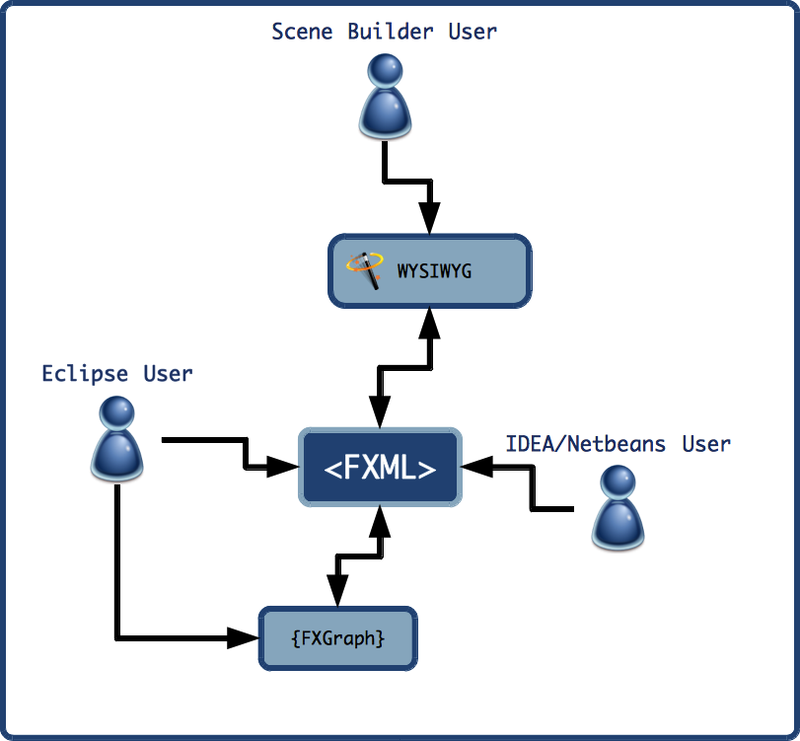 The author there talks about FXGraph and that it limits the appeal of e(fx)clipse which is think is not correct because nobody is forced to use the DSL I’ve been working on (use what ever you want – Java, GrooveFX, ScalaFX, …). It’s true that I currently don’t provide good tooling support for FXML but I plan to work on an FXML tooling so that people who want to directly edit them get decent support for it. What’s missing at the moment is an FXML to FXGraph translator but this is something not really hard to implement so it’s already on my TODO-List for 0.0.10. With the exception of in-line text links, I find that I’m able to produce virtually anything my mind conceives with FXML and CSS – without tooling. Coming from OpenLaszlo, FXML is a godsend and I plan to continue editing FXML files – directly – even when the best tooling is available. I plan to ship an initial support for FXML-Editing in 0.0.10, combined with a bidirectional FXGraph FXML conversion this allows you to switch from on to the other without any problem. What about direct FXML support for your preview component? I’d like the idea that I could use the preview with FXML directly. This would probably require some kind of side car file to provide the extra information needed by the previewer. I’m using your release of e(fx)clipse version 0.0.8. Nice work you’ve done on this plugin. 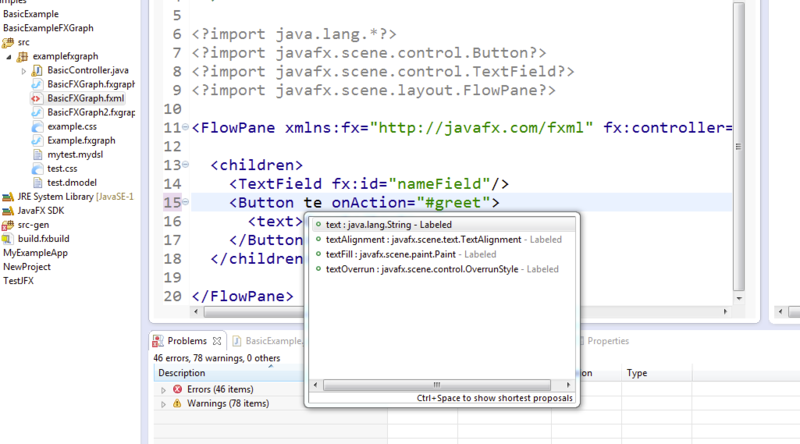 I’m going to use your plugin to make some javafx demo. I check out your git source and trying with the examples in your testcases. The Eclipse IDE show error icon at keyword “styledwith” with message: “Could not resolve reference to JvmType ‘stylewith'”. Also, the same error message for keyword “resourcefile” and “rstring”. Could you show me how to fix these errors or any workaround might have. Thanks in advance. Thanks for testing. The test cases in the example are already running on the new codebase (there are some incompatible changes and new features). I plan to do a release 0.0.9 today in the afternoon so if you wait for tomorrow you’ll see all those examples working. I hope this helps to clarify the situation.